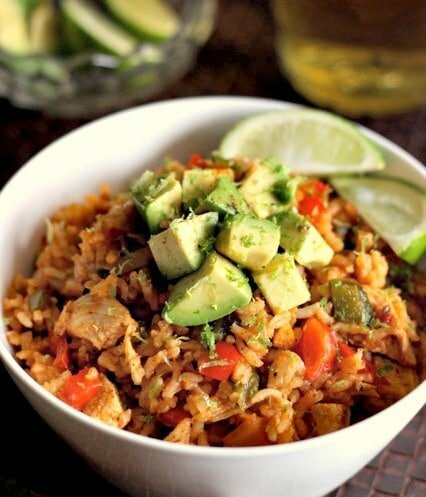 This Chicken Fajita Fried Rice is the perfect recipe for your take out dinner at home! 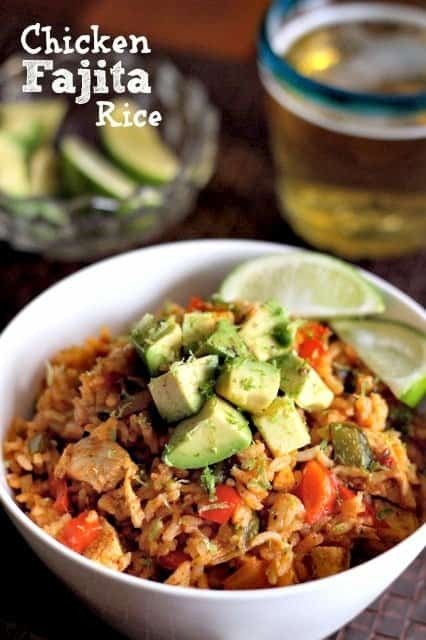 This fried rice recipe is so good, it’s better than the restaurant version! 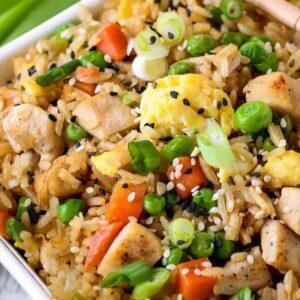 If you love fried rice as much as we do, try this Chicken Fried Rice, our favorite Hibachi Pork Fried Rice, or even a low carb Cauliflower Fried Rice! You know that delicious Mexican rice you get on the side when you’re out at a Mexican restaurant? This tastes just like that – but even better. 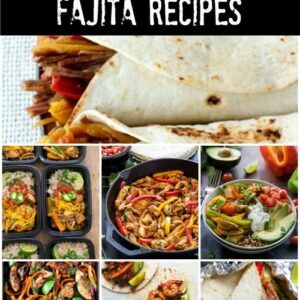 We make chicken fajitas at home a lot. It’s a great way to get vegetables into your dinner recipes and they’re pretty healthy for you. Especially when you’re making them at home where you can control the oil that’s going into the recipe. Which is why we actually prefer to make our chicken fajitas at home, you can still get that great charred flavor and have them more often! 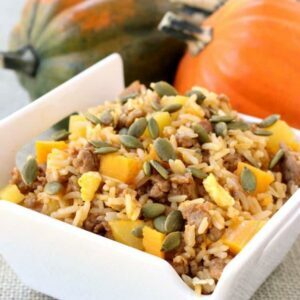 How Do You Make This Fried Rice Recipe? First place all your vegetables in a large skillet and let them cook for 7-8 minutes. You want your vegetables to get charred like this so they have that sizzling fajita taste. We’re using a couple different colors of peppers, onions and garlic. Next stir in your shredded chicken, cooked rice and seasonings…and you’re done. This chicken fried rice recipe made at home is way better tasting than ordering out and I’m pretty sure a lot better for you. My wife did the calculations (for those of you that are interested) and a serving of this rice is only 5 Weight Watchers points. You can even add a light beer for another 3 points…a definite for me if I’m eating Mexican food. Or any food really. 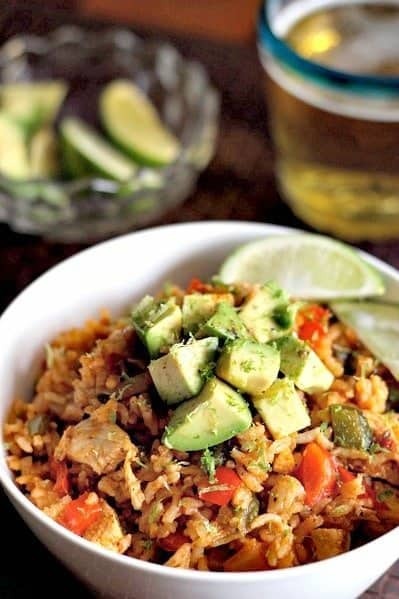 This fried rice recipe uses all the flavors of your favorite chicken fajita recipe! You can swap out rotisserie chicken to get this chicken dinner on the table fast! Season the chicken with cumin, chili powder salt and pepper on both sides. Add the tablespoon of olive oil to a wok or large skillet, then add the seasoned chicken. Cook for 5 minutes, stirring until chicken pieces are cooked through. Remove to a plate. 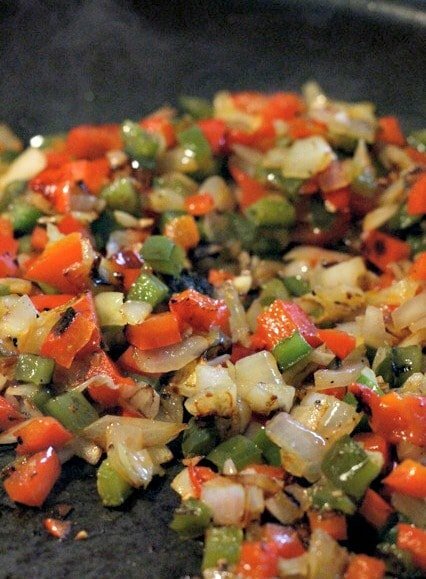 Heat the other tablespoon of olive oil in the skillet, then add the peppers, onions. Cook until slightly charred over medium-high heat, 7-8 minutes, stirring often. 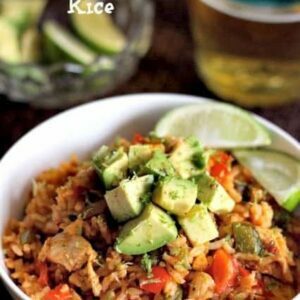 Add the rice, the cooked diced chicken, tomato sauce, salsa, hot sauce, cumin, chili powder, salt, pepper and the juice of the lime to the pan. Stir to combine then turn the heat down to low and let cook for 5 minutes until all the ingredients are warmed through. Taste and adjust the seasonings with more salt and pepper if needed. Dish out into bowls and top with the lime zest and fresh avocado. Additional toppings could include shredded cheese, crushed tortilla chips, sour cream and black beans. If using a rotisserie chicken, shred the chicken and add the 1/4 cumin, 1/8 t. salt and 1/8 t. pepper, 1/4 t. chili powder and mix together. Thank you! My boys love it, its an easy dish to make. I made this tonight and it was delicious! I am going to put this on my regular rotation. Thank you ! Thank you Lee! I’m glad you enjoyed it! I just made a Chicken Faijta Quinoa Bowl–but I LOVE your take on rice bowl. My family would devour. Oh that sounds good too – thanks Kristen! There sure are – thanks Megan! Just made this and this recipe is amazing. I always read reviews and people are constantly changing things. This recipe is perfect just the way it is. Thank you for this recipe made me soooo happy to find such an awesome recipe that I didn’t have to change. Thank you for letting me know Terry, I’m so glad you liked it!